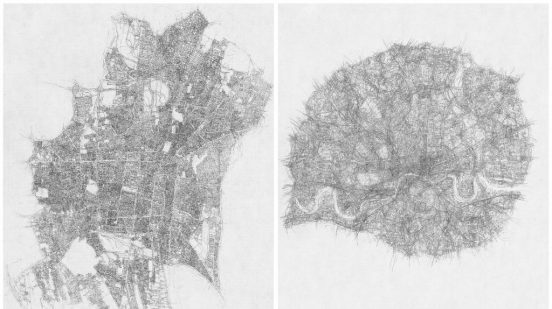 “Atlas of places” are graphic, amazing, elegant maps. They are proper works of art, witch nothing is missing. At the same time they are also useful. 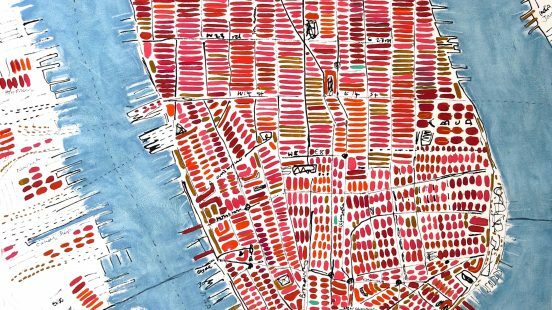 Since 2012 Barbara Macfarlane created maps of NY, London, Paris and others. 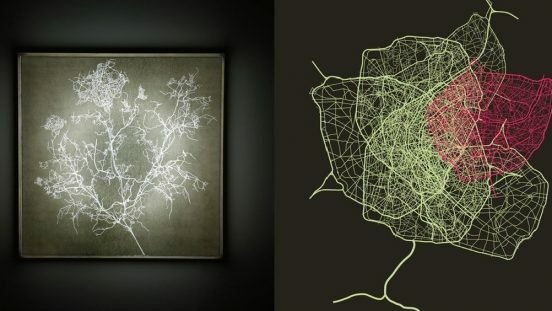 The starting point for her works are maps from the 18th and 19th centuries. 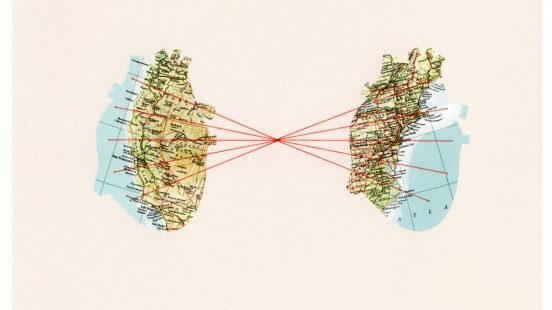 Shannon Rankin turns the maps upside down: her landscape is created with simple geometrical compositions, symmetry and equilibrium. 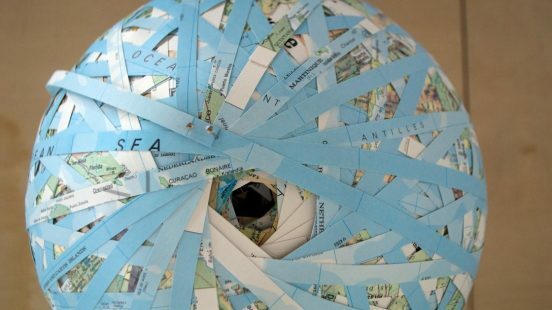 Stefana McClure’s two serie of map-art works are Map of the World and Flat Globe. 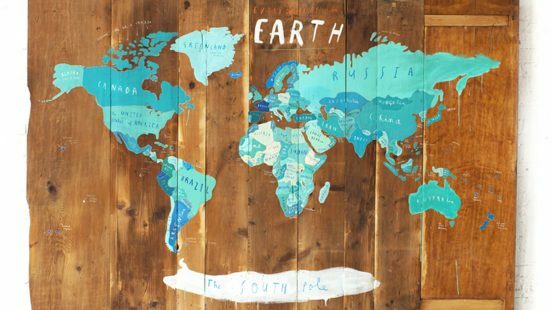 It’s interesting how this artist change each of these language. Emilio Isgrò, during decades, cancelled texts using white or black thick strokes. 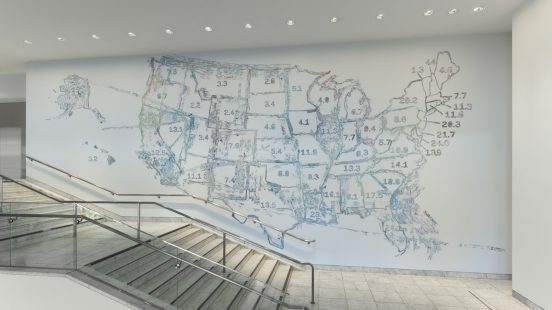 Maps are the only graphic-illustrated surface he erased during his career. 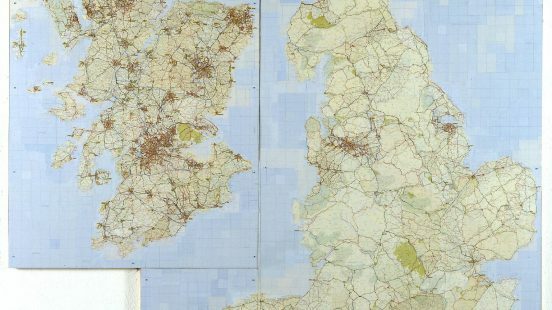 Zarina Hashmi uses works that focus on geographical boundaries to explore personal recollections or feelings of dislocation within a diaspora. 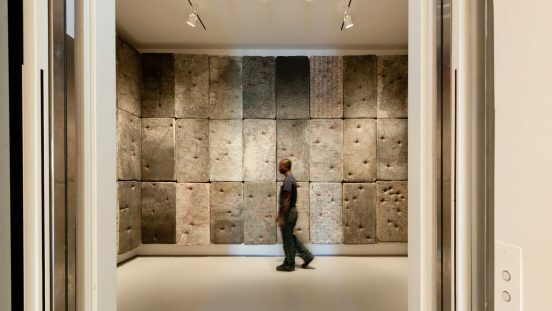 Mark Bradford glues numerous layers of paper and partially excavates sections by cutting and sanding into the stratum below. Here some exposition of his. 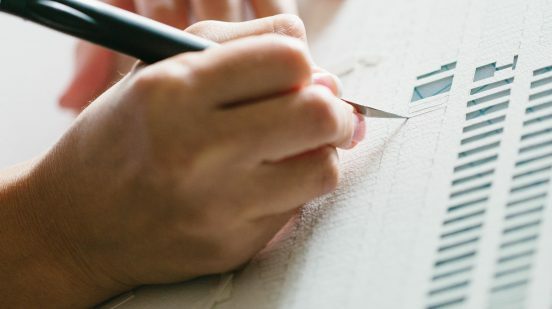 The works of Michael Gambino are populated with rarefied three dimensional clusters of paper butterflies, patiently cut by hand and fastened to the canvas. 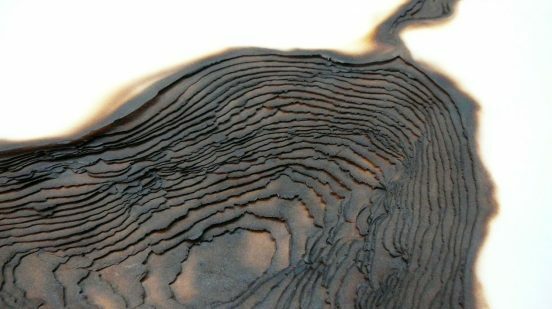 London-based artist Kate MccGwire created this topographic-ish map of the Americas out of 50 layers of burnt paper, to get over a traumatic even. 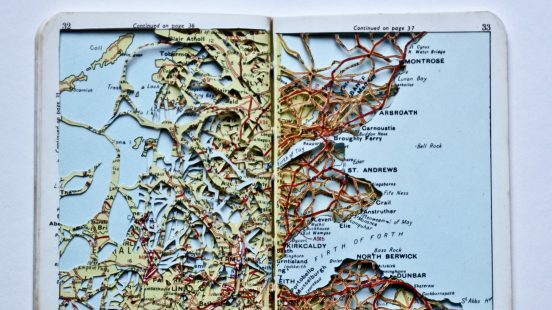 Nigel Peake ’s maps connect real places to his personal experience, travel and adventures. 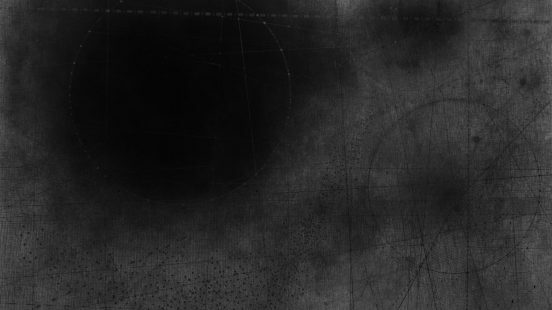 His graphics appear as infinite, calm and natural landscape. 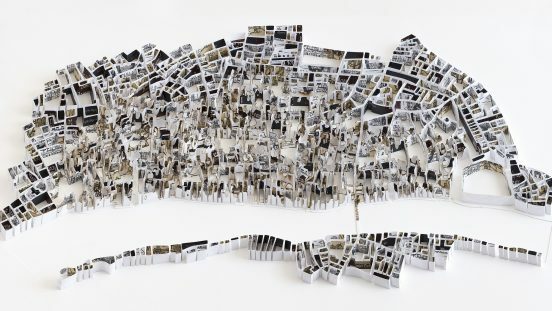 Karen O’Leary creates her works by drawing the city map on a thick sheet of paper. Then her pieces are all hand-cut once ordered, block by block. 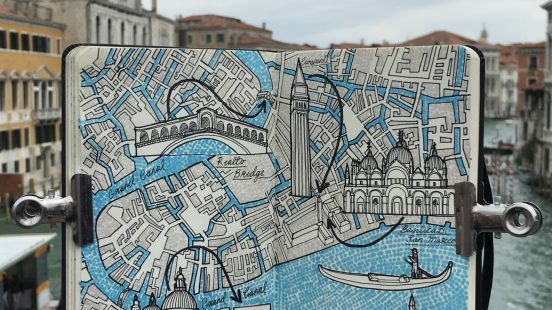 City Map Drawing is a personal project Jitesh Patel has been developing, taking day trips to Europe and Drawing maps of the cities. 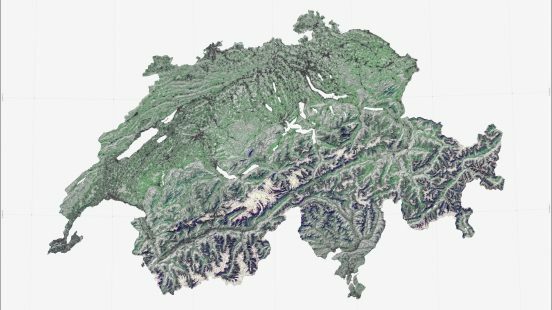 Esther Kokmeijer explores quantifiable positions related to geographic coordination systems, climatic phenomena and politically vs topological borders. 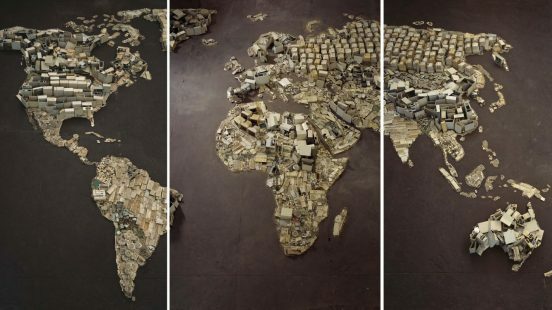 “www (World Map)” is an photo representing a planisphere which it ‘s builted with several electric and electronic parts: Vik Muniz’s thoughts about waste. 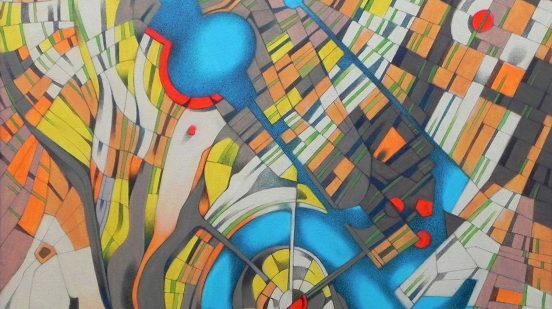 Sue Beyer likes the line and form that can be found in mapping. 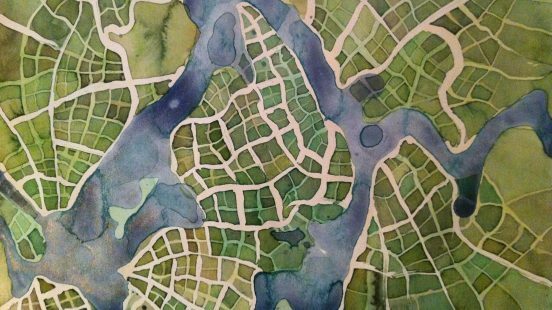 She also appreciates maps because they show how to order an essentially chaotic landscape. 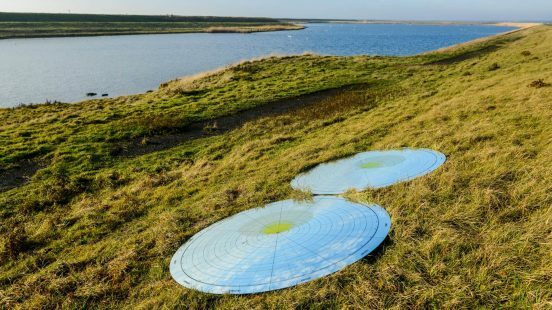 Kathy Prendergast explores issues of identity, sexuality, landscape and mapping in work that encompasses sculpture, drawing, painting, and installation. 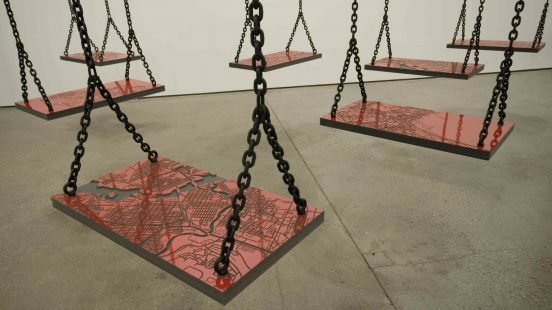 Matthew Picton ’s sculptural work investigates a city’s narratives and its history using texts and materials evocative of the events that define it. 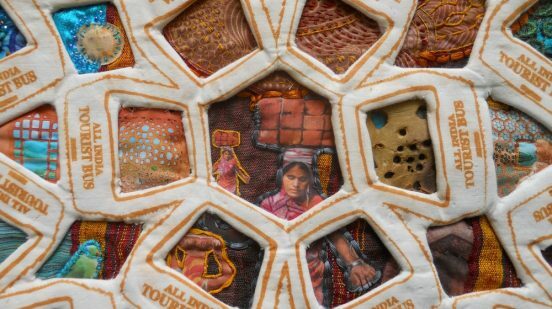 Susan Stockwell recycles materials to comment on issues of ecology, geo-politics, and more. 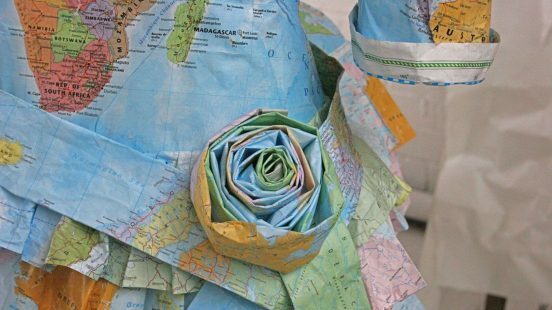 Maps allow her to identify society’s power and communication. 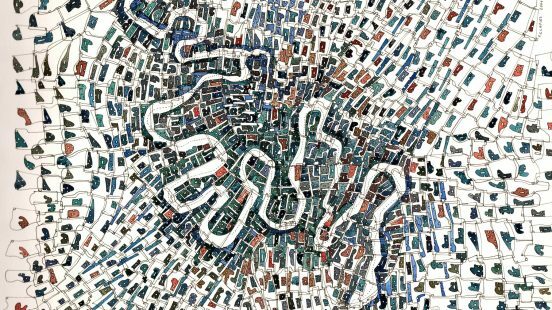 In the late 1980s and early 1990s, Guillermo Kuitca began working on installations based on typographies, geographical maps and architectural plans. 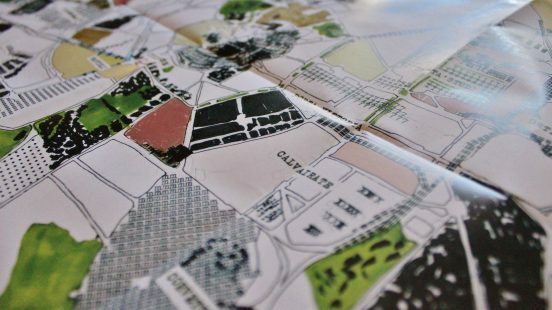 Diane Savona says that maps are usually adopted to demonstrate position, location….but they can be used to hold stories and feelings about a place. 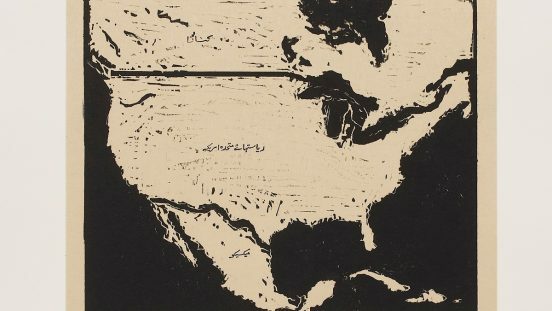 Mona Hatoum’s life deeply influenced her art, because she can’t return to her country because of the war. She talks about it through her installations. 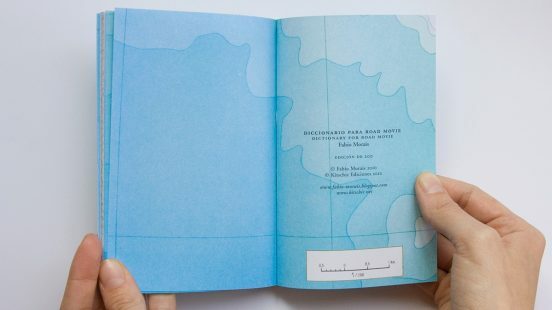 Oliver Jeffers’ good at summing up the most important spot of a city with simplicity and irony; at the same time he catch in a map its mood and atmosphere. 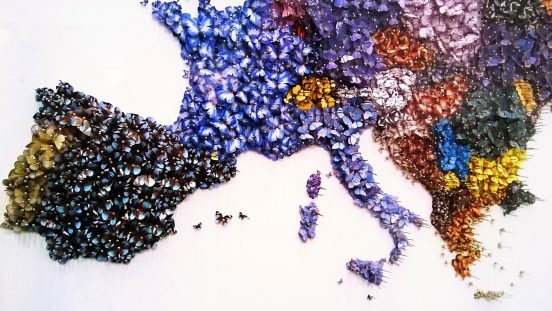 “United Kingdom” by Layla Curtis. 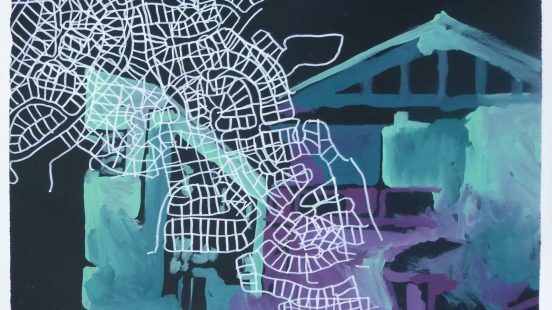 She tries to demonstrates the artificiality of political boundaries and the national identities created by them. I casually find out and this interesting map. 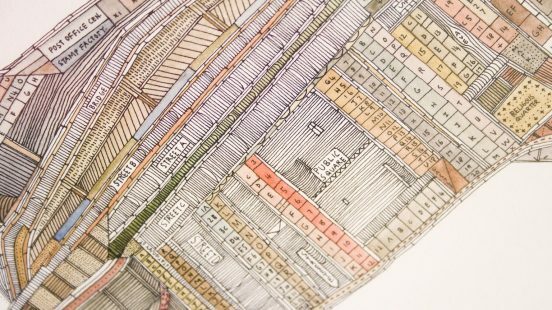 Its creator is named Lilo, a young artist who works with typewriter and inks to create amazing compositions. 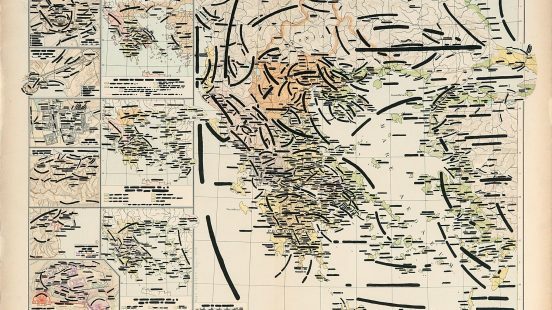 “Every language is created with the purpose of communicating information.” Through his maps Federico Cortese is searching for new languages. © 2019 cARTography. Theme by Anders Norén.